Before you clock off and look elsewhere, this is not going to be a rant about how bad Avis customer service is - it's an illustration of how broken processes (in this case of information exchange and actions related to that information) can affect a company's bottom line. I was in Croatia in September and booked a car from Avis for a trip into the mountains. I chose Avis because their location was close to where I was staying. Come the day of the collection, we went to the address given (at the Sheraton Hotel) but couldn't find Avis. At the reception we asked and they informed us that Avis had moved to a location a few kilometres away on 1st July. They were turning away "tens" of customers every day, who were all coming to search for Avis. It took us a while to get to the new location, and when I vented my frustration to the staff there they just shrugged their shoulders. "We've e-mailed head office - what more can we do?". They weren't bothered about the "tens" of customers they were losing. Back in The Netherlands I searched the global Avis website for a complaint form. No, they don't have that - they are clearly confident of the quality of their services - so I sent "feedback". After some days the reply came back that complaints had to be dealt with in the country of my residence, The Netherlands, even though they have no responsibility for the website. After some weeks I called Avis in The Netherlands (on a premium rate number - this is me trying to help this company to get back its customers by spending my own money) and found that the complaint was being processed - by sending it on to the office in Croatia. Even if Croatia did nothing (and what could they do except send another e-mail to head office?) the Dutch office would then pass this information on to me, and nothing would have actually happened except that the time of a lot of employees and a customer had been wasted. When I explained the problem to the customer service representative at the Dutch office, she admitted it took many months to get any changes made to the website at all. In the meantime the website is still sending people to the wrong place. If we reckon on Avis losing 10 customers per day because of this I'm reckoning that, as of today, that's 900 customers. Avis seems to think it's big enough and profitable enough to carry this sort of loss. A slight tweak in one of its processes (which would cost nothing - in fact, it would save money because staff wouldn't have to field complaints like mine) would have a huge effect on its bottom line. Time to try harder, Avis? You'd think this was long enough for a street name, but the sign actually contains abbreviations. 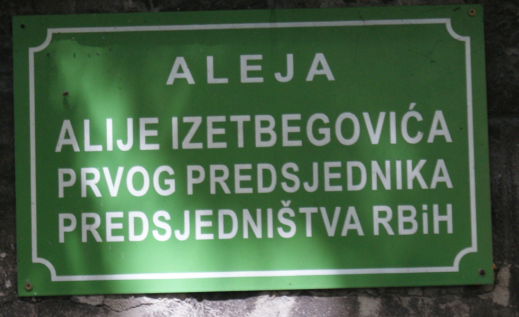 To write this street name in full would take 89 characters. It could be correctly abbreviated to 20 characters, but would you know how? In how many ways might this street name be written? I may be more than a little weird, but I love this kind of diversity in addressing!